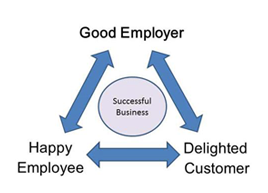 Are you planning to recruit Happy Employees ? Happy Employees are More Efficient, More Productive and Stay Longer. We are one of the fastest growing IT Permanent Staffing Consultant / Executive Search Agency based at Hyderabad, India. We started our journey in 2008 and since then, have worked/ working for esteemed Clients in Hyderabad. Our focused Verticals are Information Technology, Medical & Biotech and Health Care. Apple Informatics, since its debut, always seeks to place the right candidate at the right position and is regarded as a leading Placement Consultant for small or medium enterprises and corporate companies. At Apple Informatics, We approach collaborative hiring process for our clients as Collaborative recruiting is all about sourcing better candidates as a team, evaluating strategically as a team and agreeing on better hires through consensus-building. Our IT Permanent Staffing services team works closely with your HR managers to ensure that we get started on the right foot. At Apple Informatics, we shoulder the entire responsibility of posting advertisements, attracting talent, screening resumes, assessing candidate skills and organizational fit, in order to identify the right person for the job. Why are we different than other recruitment agencies? Our database of candidates developed over the past 10 years. Deep Understanding of JOB DESCRIPTION provided by the client and getting passive candidates from competitors. Getting references from candidates placed by us earlier and other working employees.